IT is indeed a complex task to write about the issue of human rights; a nation state’s motives and objectives behind its violations; state repression to eliminate dissent and suppress those who challenge the state craft; politics and political actors working behind the issue of human rights. Pritam Singh, who teaches economics and is director of the Postgraduate Programme in International Management and International Relations at the Oxford Brookes University Business School, Oxford (UK), has dwelt on the subject in this book. The eight chapters throw light on the complex relationship between economic interests and human rights. 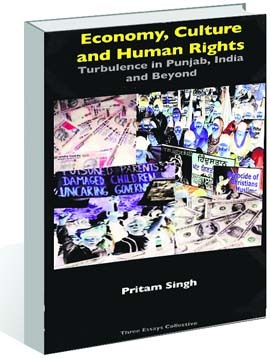 The question of human rights in the book mainly revolves around what happened in Punjab in 1984 and later, but the author has remarkably dealt with the theoretical and practical aspects of human rights at a larger international scale, right from going into the historical background, perspective of human rights, his own personal experiences with regard to human rights violations and so on. Nations such as America have used human rights as a diplomatic tool to settle political scores with the countries ideologically opposed to it such as communist China, the erstwhile USSR and certain countries in the Middle East where economic interests related to fuel energy have been dictating the diplomatic agenda. On the one hand, such nation states have been showing deep concern for human rights violations, while on the other hand these have been violently crushing human rights of the countries perceived to be a threat to their economic interests with full military might. The author never skews his sense of proportion in his narrative of various events and discusses the issue with an objective approach. "The violations of human rights in Punjab required a critical scrutiny of Punjab’s conflict ridden past, which I tried to capture in the two chapters dealing with the past and present of Punjab. The conflict between growing centralisation of power in post- colonial India and the growing regional aspirations for decentralised self rule in Punjab led to a collision in 1984 and the massive violation of human rights that followed," says Pritam Singh while drawing his conclusions. He further adds: "Accompanying this political conflict was the emergence of religion as a powerful social, culture and political force in the process of unfolding of capitalist organization of economy and society in India and Punjab. On the one hand, religion emerged as a humanistic response to the commodifying and dehumanising tendencies of expanding capitalism but, on the other, it also acted as a catalyst for sectarian mobilization and conflict." Defenders of human rights face extreme challenges and slurs. They are attacked by the state and its agencies in various ways. In a society evolved on sectarian divisions, "the articulation of human rights becomes an extremely challenging and tangled enterprise," asserts Pritam Singh, who was subjected to torture by police for his ultra-Left leanings as a student of Panjab University in the 1970s. The author builds the case for framing a more informed policy by the state and is for a farsighted approach by the human rights community. Human rights considerations in domestic policy as well as in the foreign policy regime are in long-term interests of building a more conflict-free society, he argues. The book is worth spending money on.